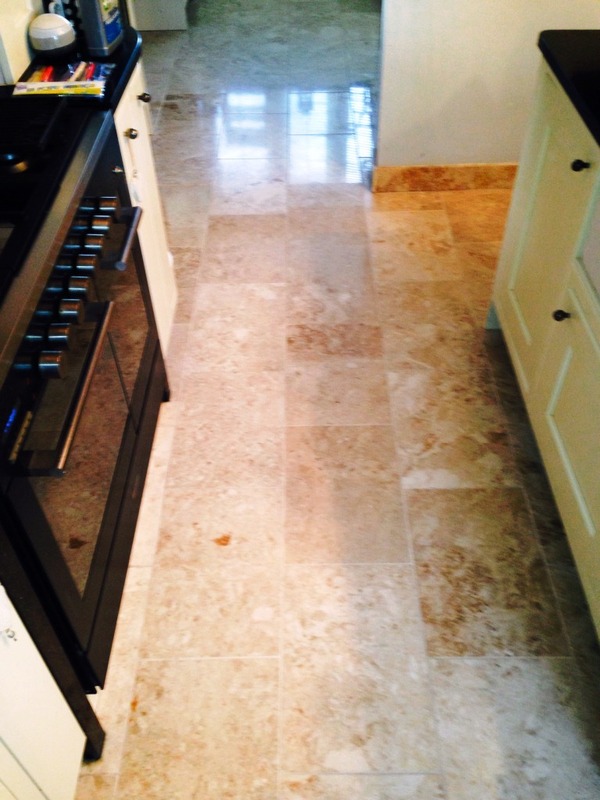 These photos are from a newly installed Polished Marble floor in the kitchen at a residence in Irthlingborough Northants which had been left covered in grout haze. 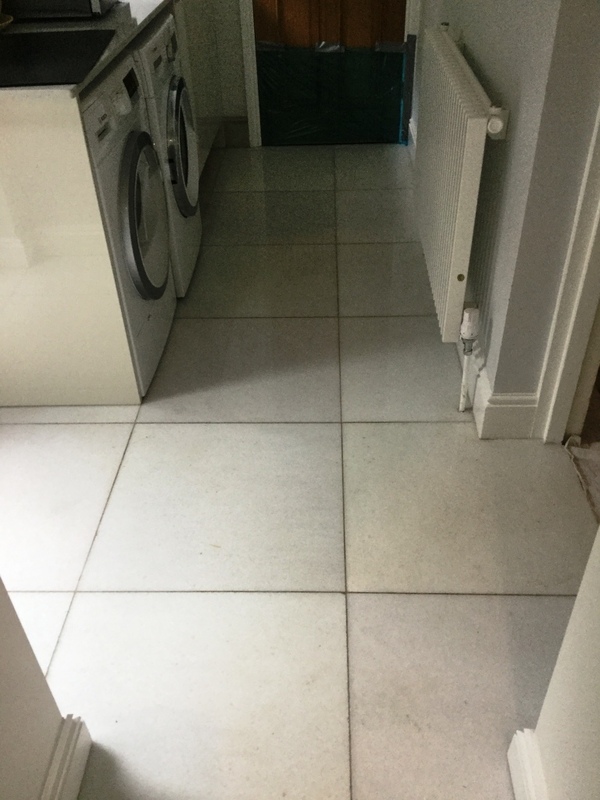 The customer called the builder back as they were unhappy with the finish but he could not rectify the problem, so the customer contacted Tile Doctor to see if anything could be done. This is a problem we often come up against where a builder or tiler does a good job of laying the tiles but for some reason doesn’t remove all the grout from the tile and we have even seen some jobs where the grout smears have been sealed over which makes it even more noticeable especially on a polished floor. Fortunately for the customer we are able to resolve such problems and after agreeing the process we set about solving the problem. To protect the kitchen units from any splashing etc. all the kick boards were removed and plastic sheeting fitted to protect new doors and panels before any work was undertaken. 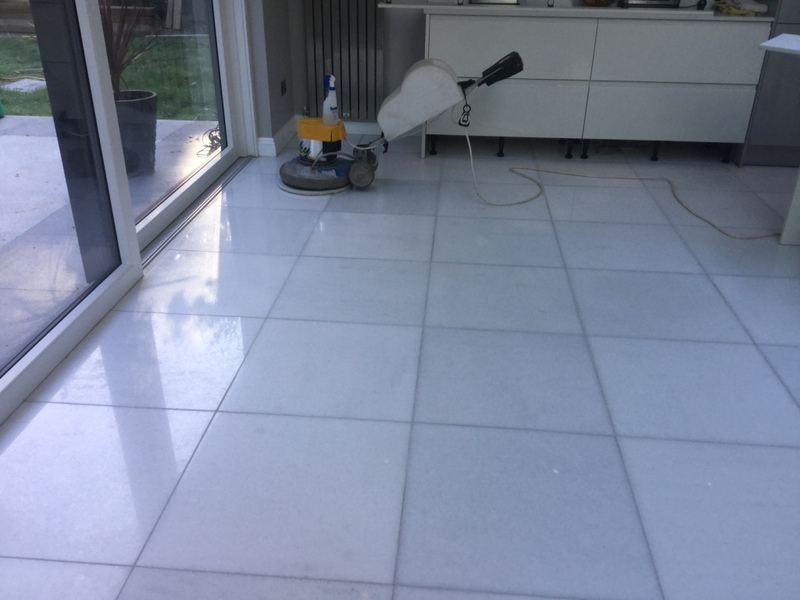 Polished Marble is a very hard surface that has to be burnished with diamond encrusted pads to restore the finish so we set about this task using a set of Tile Doctor Burnishing Pads. The pads come in a set of four, you start with the coarse pad together with a little water and this cut’s through and removes surface grime, surface seal and in this case grout haze as well. You then progress through the other finer pads one by one until you get to the final polishing pad which provides a high polish. The pads did the trick and had the surface polished to a high shine which was the look the customer was hoping they would have had in the first place. 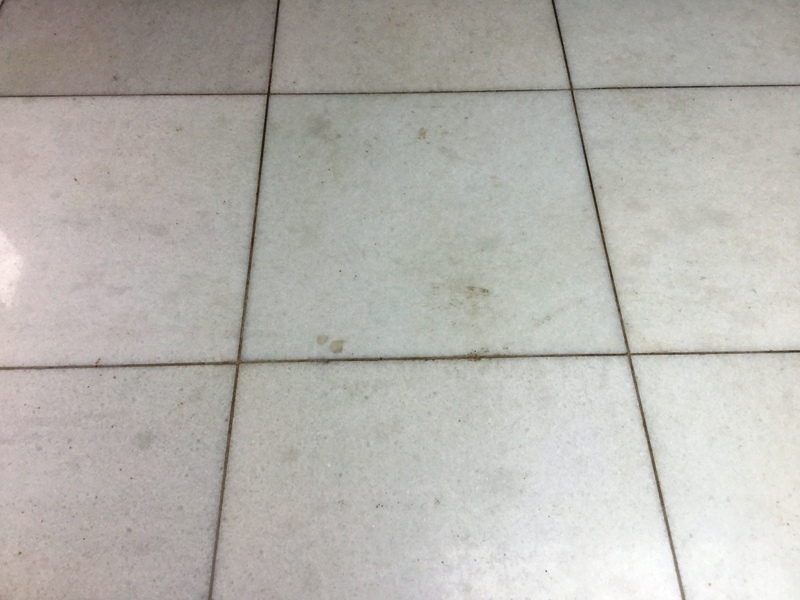 The floor was looking great but I was concerned about the grout, most people don’t realise but the top layer of grout is actually slightly porous and will attract dirt and discolour over time, this is especially the case in a bathroom or kitchen. After discussing this with the customer we sealed the grout with Tile Doctor Ultra-Seal which provides a natural look whilst preventing contaminates reaching the grout. All in the job took two days and the customer was extremely happy with the final result. 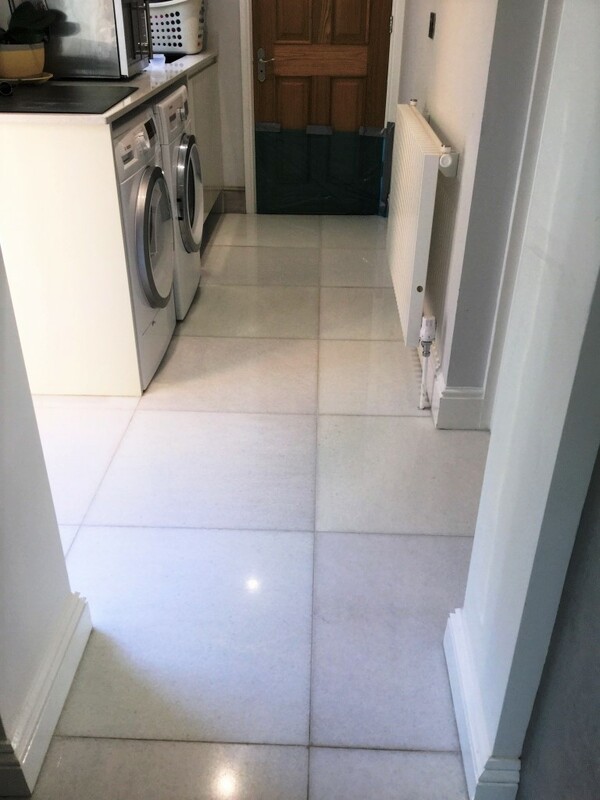 These Marble Floor tiles were installed in the kitchen of a house in Didsbury where a lot of building work had recently completed. 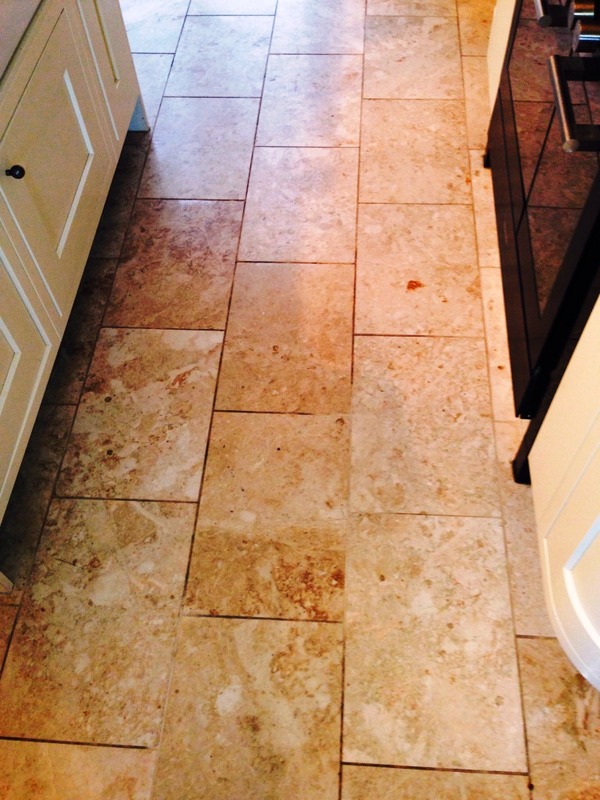 You can see from the photograph that the tiles were stained and the grout had darkened. 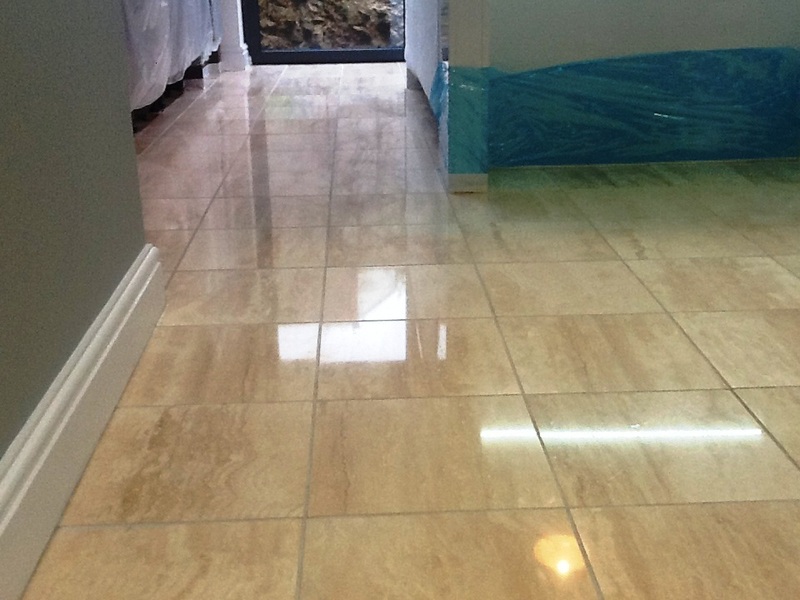 To improve the look of Marble it’s necessary to strip it right back and then polish which we are able to do with a rotary machine and burnishing pads. The pads come in a set of four; you start with the coarse pad together with a little water and this cuts through and removes surface grime and any surface seal. You then progress through the other finer pads one by one until you get to the final polishing pad which provides a high polish. Once this was done I got to work on the grout with a dilution of Tile Doctor Pro-Clean which was worked into the grout lines by hand using a stiff grout brush. The tile and grout was then rinsed down three times with clean water to remove any dirt. 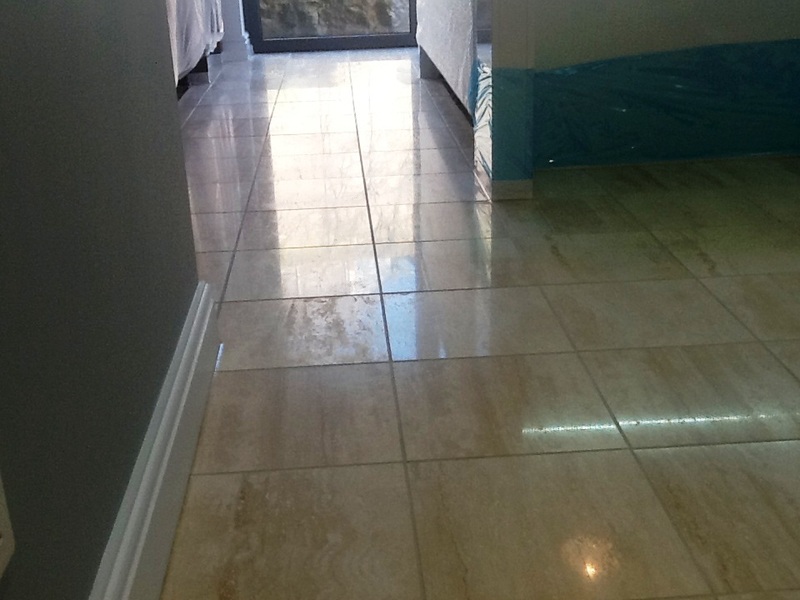 To give the floor the final finish Tile Doctor Shine powder was applied using a white buffing pad and a little water; the crystallising powder adds an extra level of shine to the Marble floor giving it that extra wow factor together and also gives it a tough durable finish. I can recommend this last step and certainly the customer was very pleased with overall finish.